When I completed reading ‘Sachar Ki Shifarishein’ by Abdur Rahman, I came to know the fact that Sachar Commission was not the only attempt in the line of development to have made in order to know the backwardness of Muslim community. The attempt like had been made earlier that ended up in formulating various commissions. In the era of British rule the process of establishing commissions had continuously been made. In this line, at first in 1871 the study of William Wilson Hunter was put up. In 1886, Royal commission was established which had Sir Saiyad Ahmad Khan and Qazi Shahabuddin as its members. This commission had particularly heaved a deep sigh for low representation of Muslims in judiciary. In 1912, Islington commission was constituted. The report of this commission brought out in 1917 showed sorry figure for Muslims who represented low in 13 departments as to their Hindu counterparts having services in 18 departments. Out of 1371 ICS officers, 1305 were Britishers, 41 were Hindus and Muslims were just 9. The commission put forwarded various valuable recommendations. Muddiman Commission was established in 1924. So, before Independence commissions and policies had been lined up to enquire into the economic, educational and employment status of Muslims and, thereby, to provide them rightful share in nation’s wealth. The book sorrowed deeply on a document published by Inder Malhotra in 1965 for failing representation of Muslim community in the sector of employment. At that time, of Central Secretariat Services Muslims were only 6 out of total 681 on upper grade level, whereas on low grade level they were only 4 out of 2000. Out of 9900 stenographers Muslims numbered at 21. An American journalist Joseph Lelyweld (1968) held Muslim’s falling motivation and discriminatory attitude adopted by the country towards them for their deteriorating condition. On May 10, 1980 Indira Gandhi government founded Gopal Singh Commission. The commission had spent 57.77 lakh and submitted its report to the government on June 10, 1983. But the government adopted all possible schemas to bury the report, however, the grief over the death of Gopal Singh and the anguish inside minorities compelled the government to present it in Lok Sabha on August 24, 1990. But the contemporary government had refused to accept all recommendations of the commission. In 1989, the study of Surendra Navlakha was produced. Everyone knows what fate meets Ranganath Mishra Commission. Decidedly, on March 2005, Prime Minister Manmohan Singh set out Sachar Commission. The book ‘Sachar Ki Shifarishein’ emphasized the role of Sachar Commission Report in reproducing the economic, social and educational standing of Indian Muslims. This book comprehends Sachar Committee Report and acknowledges the fact that no change has been seen in the status of Muslims even after six years of commission. But the report has incited the mass to speak openly about issues related to Muslim’s backwardness. The report has developed a discourse on the beliefs and values of Muslim community, and created numerous dialogues that pushed Muslims in mainstream. But mostly have been in English language. This causes damage to the reputation of Sachar Commission because the message this report tried to bring about was hardly made any presence in common Muslims. 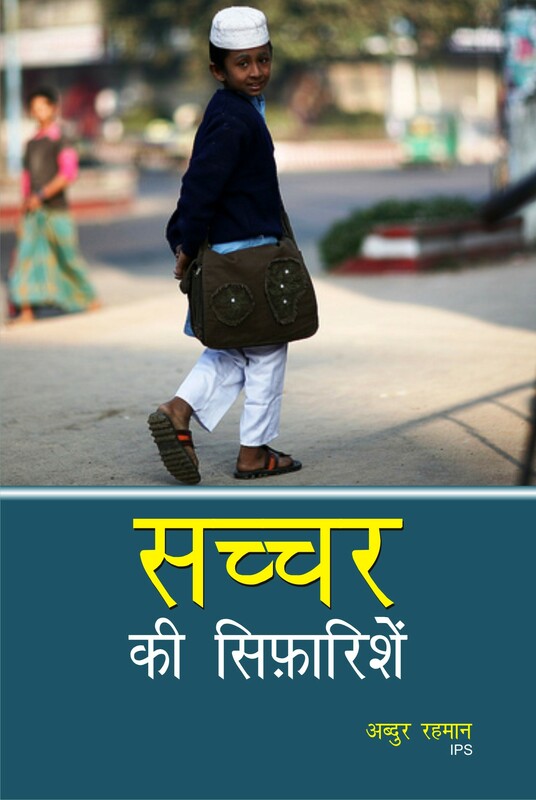 The author Abdur Rahman could be honored for the book that he brought out in Hindi. He made its recommendations reach to the common men. The author tried to link the development of Muslim community to the development of nation. So many documents he devoured to present the facts. Every chapter opens with a couplet that attests our sense of discretion. The author has been a part of Indian administration for a long time. He is an officer in the rank of D.I.G. 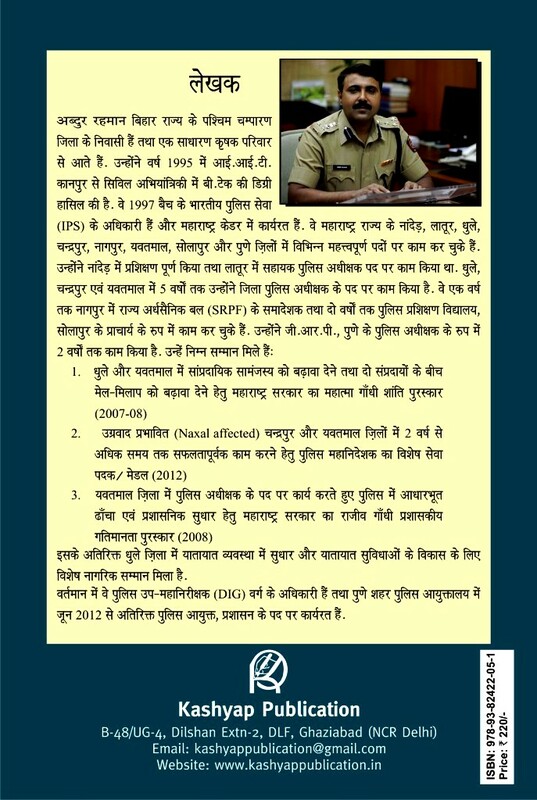 presently servicing as Additional Police Commissioner (Administration). He came from a farmer family of West Champaran, Bihar. He is an I.P.S. officer of 1997 batch posted at Maharashtra Cadre. He is sensitive to Muslim community. The author is well known for his services. He was awarded Mahatma Gandhi Peace Award in 2007-08 for the contribution he did to establish communal harmony in Dhule and Yawatamal and for the efforts he made to bring two communities together. He was also honored with ‘Rajiv Gandhi Prashasnik Gatimanta Award’ of Maharashtra Government for bringing administrative reform in police system in 2008. He has been conferred with different medals and prizes. With 14 chapters and 4 appendices this book is the best tool for a layman to understand Sachar Committee Report. A valuable attempt by the author, and a must read for all.